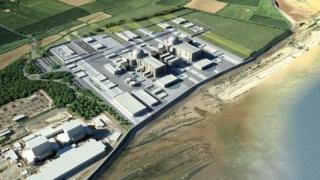 A new £24.5bn nuclear power station at Hinkley Point in Somerset is to go ahead after it received final approval from European Union regulators. The European Commission said Britain had agreed to "modify significantly" the financing for the project, reducing the burden on British taxpayers. In total 16 commissioners voted in favour of the project, just ahead of the 15 votes needed for approval. The Commission said these changes made meant gains generated by the project would be better shared with UK consumers. It estimated the project would now cost £24.5bn to build. The updated figure, much higher than the government and EDF's original £16bn forecast, includes the impact of inflation as well as interest costs for the 10 year construction period. This is the first time that the European Commission has approved significant state aid for a new nuclear power plant - and as such, it is a big step forward for the European nuclear industry. The decision will serve as a precedent for other countries, such as Poland and the Czech Republic, that want to know how much public money they can offer to companies as they look to expand their nuclear industries. But the legal fight over the funding for Hinkley Point C is almost certainly not over. The European Court of Justice will be asked for an opinion. Austria says the Commission's decision is supported by neither economic nor ecological sense. And other member states are concerned that it flies in the face of the EU's stated aim of promoting renewable energy sources, such as wind and solar. The government had already agreed that French firm EDF will be paid a so-called "strike price" of £92.50 for every megawatt hour of energy Hinkley C generates. This is almost twice the current wholesale cost of electricity, but this was a deliberate attempt by the government to compensate for the high cost of building the plant. However, the Commission said that if EDF's overall profits exceeded the rate estimated at the time it was awarded the contract, any gains would be shared with the public. It said it had also defined a second, higher threshold above which the public would be given more than half of the gains, through lowering the cost of the "strike price". "An increase in the profit rate of only one percentage point, for example, will generate savings of more than £1.2bn," it said. It said this agreement would now last for the entire lifetime of the project - an estimated 60 years. "These modifications will also achieve significant savings for UK taxpayers. On this basis and after a thorough investigation, the Commission can now conclude that the support is compatible with EU state aid rules," said Commission Vice-President Joaquin Almunia. The government estimated last year that with new nuclear power - including Hinkley - the average energy bill in 2030 will be £77 lower than it would have been without the new plants.